Maria Wills is a woman of many talents. Born in Washington, DC and raised in Prince Georges County, MD, Maria started her career at the young age of fifteen as a model and actress. Her first photo shoot put her on the cover of Mazza International Magazine. She starred in her first stage play titled “Common Realities” at the legendary Lincoln Theater. Maria Wills attended Drexel University to study Music Industry, the study of how music is recorded, produced, promoted, delivered and monetized. Her studies equipped her with a solid understanding of how the music industry fits into the larger entertainment industry and fine-tuned her management and business skills. While attending Drexel, Maria started her event-planning company “Self-Explanatory Productions, LLC (SP).” At the age of eighteen Maria produced her first fashion show, building awareness of the St. Jude Hospital for Sickle Cell Anemia at the Pennsylvania Convention Center. Self-Explanatory Productions has produced events benefiting The Lung Cancer Foundation, Women in Transition, Families First, The Crohn's and Colitis Foundation, The Black Dolls Foundation and private events throughout Atlanta. Maria moved to Atlanta, GA in 2006 to expand her brand. She started her career in radio as the host of “Girl Power Hour” with Jae Nash. Her experience led her to create her own show "Afternoon Tea" on WWWE REAL 1100am and IHeartRadio. Host Maria Wills is “The Queen of Catchy Convo” with show topics like The Angry Black Woman, Men & Monogamy, and Blended Families. Maria is breaking barriers with her open discussion about difficult topics with celebrity friends like actor Brad James from For Better or Worse, singer Nikki Gilbert-Daniels from R&B Divas, actress Monyetta Shaw from Atlanta Exes, and SOSO Def artist Dondria Nicole. She has also had the pleasure speaking with Jada Pinkett-Smith for Red Table Talk Live in Atlanta, GA and Marjorie Harvey during her “Girls Who Rule the World” event. 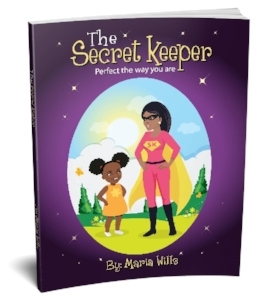 Maria Wills recently added “published author” to her resume, with her first children’s book entitled, “The Secret Keeper: Perfect the Way You Are,” which was inspired by her daughter, Juliana. The book is about a young girl who is bullied on her way to school and her superhero mom gives her the advice she needs to stand up for herself. “The Secret Keeper: Perfect the Way You Are” inspires young readers to the stand up to bullies, not by resorting to violence, but with confidence and kindness. It is the first book in a five-book series. Keep your eyes and ears open for what Maria Wills has in the works.